It is a tradition of the Vancouver International Wine Festival that many producers, even though limited to four or five wines in the tasting room, are likely to have an extra wine or two under the table. The international wineries might be constrained because their wines all come by way of consular privilege. Not every consul will be bothered doing the extra paperwork. But at the 2017 festival in mid-February, there may be more than the usual number of hidden treats. The theme region is Canada and the Canadian wineries obviously need no consular help to bring an extra wine or two, as long as they navigate the paperwork with the BC Liquor Distribution Branch. Which brings me to Culmina Family Estate Winery, the Triggs family winery from Oliver, and one of the 60 British Columbia wineries in the festival. The winery will be releasing new vintages, including the 2013 Hypothesis, its flagship Bordeaux red blend. This is just the third vintage of this wine, first made in 2011. The winery will also show two of the three varietal reds recently added to its portfolio – a Merlot and a Cabernet Franc – plus a few of its excellent whites. And I am guessing that there might be a few bottles around, unofficially, of the winery’s newest release, the No. 001 Haut-Plateau Riesling 2015. Only 21 cases were made and virtually all was allocated to “Culmina Members” – those who subscribe to the winery’s on-line newsletter. Culmina, which opened in 2013, began developing its 56-acre vineyard in 2007, with plantings spread over several years. With each year, the vines are maturing and also are more productive. This is enabling the owners, Donald and Elaine Triggs and their daughter Sara, to expand the portfolio at a steady but measured pace. The winery came to market initially with just Hypothesis, a rosé, and three whites – a Chardonnay, a Riesling and a Grüner Veltliner. In subsequent vintages, Culmina has added two blends: a red and a white under the R&D label. Recently, the winery has begun to release varietals. The Haut-Plateau Riesling is the first of the winery’s so-called numbered series. That series promises to generate exciting wines – the sort of wines that winemakers like to make and that consumers love to taste. The numbered series are intended to reflect both terroir and innovations in viticulture and in winemaking. “These are wines that we geeked out over in the cellar,” the winery adds. The grapes for this wine are from “four specially designated rows of Alsatian clone 49 Riesling from Block XI on Margaret’s Bench,” an upper plateau of the Culmina vineyard. The grapes remained on the vines until November 15, 2015, very late in the season. The result is a flavour-packed wine finished with 30 grams of well-balanced residual sugar. The model was an Alsace Grand Cru Riesling. The opportunity to make wines like this also engages a winemaker’s interest. This wine would have been made by Pascal Madevon, now a winemaking consultant in the Okanagan. When he decided to hang out his shingle early in 2016, Culmina recruited Jean-Marc Enixon who – like Pascal – is French born and trained and who worked (briefly) at Osoyoos Larose Winery. He was also attracted by the opportunity to maker white wines, something not done in his previous careers. Osoyoos-Larose also produces just reds and grows no whites in its vineyard. Jean-Marc was born in 1981 in Charentes, northeast of Bordeaux. “My parents had a chateau on the right bank in Bordeaux, in the Fronsac appellation – Chateau Puy Guilhem.” After he completed his viticultural studies in Toulouse in January, 2005, he took over responsibilities at the château. “The estate was 15 hectares,” Jean-Marc says. The vines were primarily Merlot, with modest plantings of Cabernet Sauvignon and Malbec. He ran the château for a decade before selling it in 2014. “After that, I took some time off with my wife, Audrey, and my son.” Jean-Marc says. He spent a year helping other French winemakers before beginning to look for winemaking opportunities in other countries, including Canada. Osoyoos Larose was recruiting a new winemaker early in 2016 and that was the opportunity Jean-Marc needed to get to the Okanagan. Six months later, he moved to Culmina. “I came here to make white wine and here I have the opportunity to do it,” he says. A recent tasting at the winery gave me a second look at Culmina wines that I have already reviewed (all 90 points or better), along with several newer releases. The whites include Dilemma (a Chablis-style Chardonnay), Decora (a dry Riesling) and Unicus (the winery’s delicious Grüner Veltliner). Previously-reviewed reds were R&D Red 2014, an accessible blend anchored on Merlot, and Hypothesis 2012, an age-worthy Bordeaux red blend. We also tasted the sold-out rosé, Saignée 2015. Here are notes on the additions to the portfolio. R&D White Blend 2015 ($20 for 180 cases). The winery’s first white blend, it is 65% Chardonnay; the remainder of the blend is Riesling, Gewürztraminer, Viognier and a dash of Grüner Veltliner. The result is a dry white with good aromatic aromas and flavours of lychee and apricots. 90. Culmina Merlot 2013 ($31). The wine begins with aromas of spice and plum. Full-bodied, the wine delivers flavours of black cherry, blueberry and plum. The tannins are ripe but still have grip, suggesting a wine capable to cellaring. 91. Culmina No. 001 – Haut-Plateau Riesling 2015 ($30 for 21 cases). This is a remarkable wine, beginning with aromas of peach and lychee, leading to rich layers of flavour that include nectarines, apples and lychee. The finish is luscious with a lingering residual sweetness. 95. Three red wines released in November by Cassini Cellars showcase the singular house style of this south Okanagan winery: big, ripe and full of bold flavours. Each of these reds has 15% alcohol. That is at the upper range for Okanagan reds, most of which come in at 13.5% to 14.5% alcohol, if the labels can be believed. I am not suggesting that is what Adrian Cassini is doing. If the alcohol levels were higher even than the label states, consumers would notice a bit of heat on the finish. No heat is evident in Adrian’s wines. The wines are so rich and concentrated that they handle the alcohol. Nor do all of Adrian’s wines pack quite this much power. Other wines on the winery’s website show a range of alcohols between 13.9% (for 2013 Mamma Mia, a white blend) to 14.5% (for a 2013 Cabernet Merlot blend). It is clear that he set out to deliver the maximum ripe flavours in the three reds that come in at 15%. By low-tonnage production and by hanging the grapes late into the season, he succeeded very well indeed. Production of each wine is limited with Cassini wine club members first in line. The wines are a good argument for joining that club. They can also be ordered directly from the winery. Adrian’s style recalls the slogan of the Ravenswood Winery of California: “No wimpy wines.” That winery admits to 15.1% alcohol on several of its muscular Zinfandels. Since Cassini Cellars opened in 2009, Adrian has hosted me to several tastings, including barrel and cellar sampling. I once described his exuberant style as con brio, a musical term loosely defined as “with vigor.” That perfectly describes the three reds reviewed here, all of which are single vineyard wines. Cassini Cabernet Franc Collector’s Series 2013 ($34 for 295 cases). This wine has five percent Merlot in the blend. The wine begins with aromas of blackberry, black currant and pepper. The aromas are echoed in the flavours, along with black cherry and vanilla. The muscular texture has been polished by aging 24 months in new barrels (80% French, 20% American). 92. Cassini Nobilus Merlot Collector’s Series 2013 ($40 for 187 cases). The wine, which was aged 24 months in new French oak, begins with appealing aromas of vanilla mingled with black cherry and raspberry jam. On the palate, there are flavours of black cherry, vanilla, cedar and chocolate. The tannins are long and ripe but with grip. This wine will age superbly. 92. Cassini The Aristocrat Cabernet Sauvignon 2013 ($40 for 290 cases). This wine was a selection of the best eight barrels of Cabernet Sauvignon in the cellar from a total of 45 barrels. This is a bold, dark-coloured wine, beginning with aromas of cassis, black cherry and vanilla. On the generous palate, there are flavours of figs, dates, black cherry and chocolate framed by spicy oak on the finish. The winery suggests this wine can be cellar to 2025, although it is drinking well already. 93. Some years ago, I encountered a grand piano in the barrel cellar of a California winery. The explanation, so I was informed, was that the winemaker liked to play to his wines. I thought my leg was being pulled. But since I have begun visiting Lunessence Winery & Vineyard in Summerland, I think that explanation was true. Michal Mosny, the general manager and winemaker at Lunessence, plays classical music in the vineyard, in the cellars and in the tasting room. The vines are treated to Bach and Mozart. The red wines get Puccini operas while the whites get Verdi operas. In 2011, Michal and his wife, Martina, emigrated to the Okanagan. He set up a vineyard management company; that led to him being recruited in 2014 to manage Lunessence and its six-and-a-half-acre vineyard. The property formerly was the Sonoran Estate Winery until it was purchased and rebranded by Zhizhong Si, a China-born environmental consultant who was educated in Canada. He is now based in Vancouver. Since 2014, the tasting room has been renovated and a new production facility has been built elsewhere on the property. And, of course, speakers have been deployed in some parts of the vineyard. Michal will concede that it is difficult to prove that wine benefits from good music. But there is no harm in it. Besides, he loves classical music. Those who share his taste will agree that the Lunessence tasting room is one of the most listenable in the Okanagan. Here are notes on Lunessence wines that I tasted on two different occasions in 2016. Some will now be sold out but the scores suggest the proof of Michal’s theories is in the bottles. Lunessence Riesling Reserve 2015 ($28 for 100 cases). This wine was fermented to dryness with native yeast. It has aromas and flavours of lemon and lime with a core of minerality, along with racy acidity. This needs to be cellared for several years to reach its peak of aroma and flavour. 91. Lunessence Chardonnay Reserve 2015 ($28 for 270 cases). Thirty percent of this wine was aged seven months in Slovakian oak, positively impacting the wine’s full texture without taking away from the fruit flavours. The wine is bright and refreshing with flavours of citrus and apple. 90. Lunessence Sauvignon Blanc Reserve 2015 ($28 for 170 cases). Thirty percent of this wine – which is sold out – was aged in Slovakian oak. The wine begins with spice and tropical fruit aromas, leading to rich flavours of mango and lime. 92. Lunessence Quartet 2015 ($18 for 800 cases). This is a blend of Riesling, Viognier, Orange Muscat and Gewürztraminer. The wine is an exuberant bowl of fruit, with tropical aromas and flavours and with a finish that won’t quit. 92. Lunessence Sauvignon Blanc Muscat 2015 ($22 for 330 cases). This wine has aromas and flavours of lime accented by spicy notes from the Muscat. The texture is creamy but the wine has a crisp, dry finish. 91. Lunessence Pinot Blanc Oraniensteiner 2015 ($20 for 250 cases). This is an unusual but certainly effective blend. Pinot Blanc is a reliable workhorse white while Oraniensteiner is an obscure German white, a 1985 cross of Riesling and Sylvaner, that is grown almost nowhere these days but Canada. The blend here is 70% Oraniensteiner and 30% Pinot Blanc. The aroma and flavours had me believing the wine was mostly Pinot Blanc. It has aromas of green apples. On the palate the apple flavours are augmented with a dollop of lychee. The delicious finish lingers. 92. Lunessence Rosé 2015 ($18 for 250 cases). This is 70% Cabernet Franc, 30% Pinot Noir. The wine presents with a pale strawberry hue. It has ar0mas and flavours of strawberry and cherry. This is a juicy rosé with a lingering finish. 90. Lunessence Merlot 2014 ($28 for 200 cases). Dark in colour, this wine begins with aromas of black currants, blueberries and cherries. This is echoed on the palate. The wine has long ripe tannins, with a concentrated structure that assures long life in the cellar. Decant this wine for current drinking. 91. Lunessence Cabernet Sauvignon 2014 ($27 for 330 cases). The wine begins with aromas of cassis and cherry. On the palate, it has ageable firmness of Cabernet, with slight hints of bell pepper mingled with flavours of cassis. There are savoury, spicy notes on the finish. Lay this down for another five years at least. 91. Lunessence Syrah Late Harvest 2014 ($24 for 150 cases). The wine begins with appealing aromas of black currant jam that seem to promise intense sweetness. Happily, the flavours are moderated by the variety’s hint of pepper on the finish. This turns out to be a very nicely balanced dessert wine with lingering hints of strawberry. If you like a bit of pepper on your few strawberries, this is the wine for you. 92. Lunessence Pinot Blanc Late Harvest 2014 ($24 for 180 cases). The wine begins with aromas of ripe peach and ripe apple, leading to flavours of pineapple and Mandarin orange. The wine is not overly sweet, retaining the delicious freshness of the variety. 91. Lunessence Gewürztraminer Icewine 2014 ($58 for 80 cases of 200 ml). The wine presents in the glass with a gold hue and with intense aromas of ripe pineapple mingled with honey and toffee. On the palate, the wine is rich in texture with concentrated flavours of honeyed mango. 90. Lunessence Riesling Icewine 2014 ($54 for 150 cases of 200 ml). This wine was harvested and pressed at -16C, a figure that translates into a big mouthful of sugar balanced, in this instance, but very bright acidity. The wine has aroma of honey and ripe pineapple, with very rich and intense flavours that mirror the aroma. 92. Lunessence Merlot Reserve Icewine 2014 ($64 for 80 cases of 200 ml). The wine climbs from the glass with aromas of Ribena. On the palate, it is rich with intense flavours of black currant jam which last and last. 92. Holiday meals centering on roast turkey (with mashed potatoes, gravy, cranberry sauce and Brussels sprouts) often challenge wine pairing. Will it be a white wine because there is a lot of white meat … or a red wine for the dark meat … or a rosé because one size fits all? Although the rosé selection is rather limited at this season. The latest wines from Blue Mountain Vineyard and Cellars solve the problem. The winery has just released a sophisticated Pinot Gris and a juicy Gamay Noir, both from 2015. The wines are so affordably priced that you and your guests can have a glass (or two) of each. In our house, we like to explore food and wine pairings. There are so many flavours to deal with in a Christmas or holiday turkey dinner, including the gravy and the stuffing. It calls for wines with bold flavours and good acidity. For many years, the default varietal on our table at Christmas was Gewürztraminer, ideally from Alsace. These are aromatic dry wines whose spicy flavours stand up to the rich flavours of the holiday table. When the great Alsace Gewürztraminers priced themselves itself out of this market, a search for a dry Okanagan Goo (as winemakers call the varietal) led us to Arrowleaf Cellars. This Lake Country winery’s very well made Goo sells for just $15.40. Because a member of my family refused to drink Goo (can you imagine? ), we have explored other white varietals, such as Riesling, Chardonnay, Viognier or blends of Rhone varieties. My vote goes to Viognier or Rhone blends because the wines usually are full-flavoured with a hair of tannin for a backbone that helps cut through the gravy. I would recommend Moon Curser Afraid of the Dark ($21.90), a blend of Viognier, Marsanne and Roussanne; or Lariana Cellars Viognier. Both of these wineries are in Osoyoos, a good terroir for Rhone varieties. When it comes to reds for the turkey dinner, I don’t think you need the power of, say, Syrah or Meritage. A good Pinot Noir will stand up. Solid Pinots in the $25 range are made by Quails’ Gate Estate Winery and by Meyer Family Vineyards. If you are prepared to shell out the money, both of these producers (and others) have more complex Pinot Noirs in the $45 - $50 range. I have been digressing. The point of this blog is to direct you to the new releases from Blue Mountain, which should be available in good private wine stores. For example, Everything Wine stocks the Pinot Gris and several other Blue Mountain wines. The Pinot Gris’s crispness, acidity and flavours seem to me a perfect pairing with white meat of the turkey while the rich and generous flavours of the Gamay Noir can handle the dark meat, the stuffing and the gravy. Blue Mountain Pinot Gris 2015 ($20.90). The winery fermented 60% of this in stainless steel and 40% in barrels. The latter portion remained on the lees for seven months in three-year-old barrels. The two lots were then blended. The barrel portion adds a rich texture to the wine without suppressing the fruit. The wine is crisp with aromas and flavours of pear and citrus. There is a hint of spice and vanilla on the finish. 91. 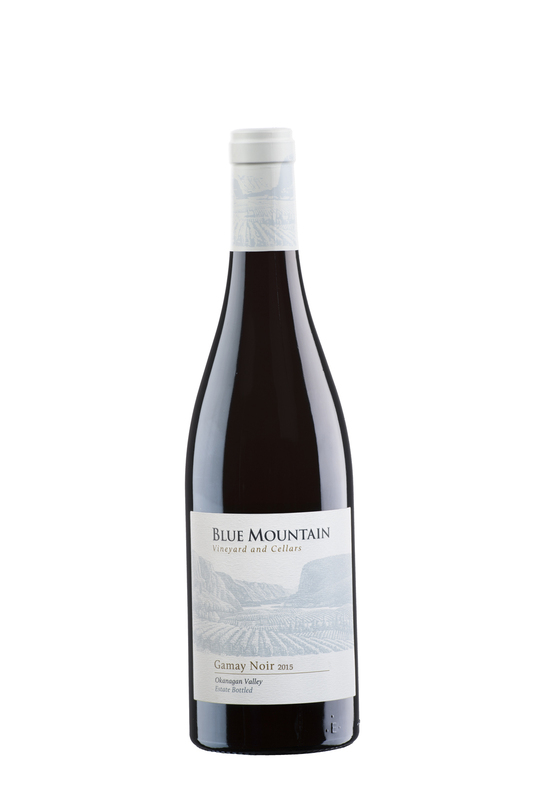 Blue Mountain Gamay Noir 2015 ($22.90). This wine was fermented with native yeast and was aged 10 months in four-year-old barrels. It begins with aromas of plum and cherry which are echoed on the palate. There are spicy notes on the finish. The wine is remarkable for its seductively silky texture. 90. Perhaps the most famous wine made by Sumac Ridge Estate Winery, which Harry McWatters founded, was Steller’s Jay Brut. This multiple award-winner was first made in 1987. Over the years, Harry sabered countless bottles of Steller’s Jay. He liked to quip that sparkling wine was what he drank while deciding what wine to have for dinner. Sumac Ridge eventually was acquired by Constellation Brands. Harry remained a director for some time until retiring in, memory serves, 2008. Then, his access to Steller’s Jay was limited to wine stores. Harry did not stay retired all that long, if at all. Now, under a holding company called Encore Vineyards, he manages three brands – Time, McWatters Collection and Evolve Cellars. This year, Lawrence Buhler, Encore’s winemaker (left), resolved Harry’s need for sparkling wine by making two for the Evolve portfolio. Sometime next spring, those wines will be required to help celebrate the opening of Harry’s new winery in downtown Penticton. Initially, Harry had begun to build his new winery on the Sundial Vineyard on Black Sage Road; construction started in 2015 with the pouring of the barrel cellar. As was widely reported earlier this year, Harry accepted an offer for the property and the nascent winery in April, 2016. The new owners will complete the winery this summer, having made 2016 wines for their new label, Phantom Creek Estates. The design is even grander than the one begun by Encore Vineyards. Ever fleet on his feet, Harry (and the Encore investors) bought a former movie theatre in downtown Penticton last summer. Renovations are ongoing, with plans to open a wine shop in the spring. That’s why Harry needed new sparkling wines (aside from having something to drink before dinner). I have not been able to find technical specifications for the wines. I am guessing they are fermented in tank, given how long it takes to complete bottle fermenting bubblies. The current vintage of Steller’s Jay is the 2009. This is a wine that, like Champagne, spends four or five years on the lees before being disgorged. There are other methods of making good sparkling wine, as these two wines demonstrate, that are faster and don’t tie capital as long. By fermenting with encapsulated yeast in the bottle, the winemaker can accelerate the process. There is no need to spend a month or so riddling the bottles. When the yeast has done its work, one simply inverts the bottle to collect the beads of yeast in the neck prior to disgorging. One can always carbonate a wine but that is done only for the cheapest of sparkling wines. Wines fermented in pressure tanks are much better and the bubbles last longer. Most Prosecco, which has become wildly popular, is made this way. I note that the Evolve wines are priced to compete with Prosecco. The current releases from the Encore stable include two red Meritage wines and an outstanding Syrah. Evolve Pinot Blanc 2015 ($14.99). This wine begins with Granny Smith apple aromas leading to flavours of apples, pears and honeydew melon, with a spine of minerals. The wine has good weight on the palate, with a crisp and dry finish. 88. Evolve Effervescence NV ($19.99). This is a blend of Pinot Blanc and Chardonnay. The wine has fruity aromas and flavours and presents a display of active bubbles in the glass. The hint of residual sweetness is well balanced, resulting in a refreshing, easy-drinking sparkling wine. 90. Evolve Pink Effervescence NV ($19.99). This is a blend of Pinot Blanc and Merlot. It is a festive wine in the glass, with a pink blush and with active bubbles. There are toasty and fruity aromas, leading to flavours of strawberry. The bubbles add to the creamy texture. 90. Time Meritage 2013 ($25.99). This is 39% Merlot, 36% Cabernet Sauvignon and 25% Cabernet Franc, according to the online specification; and 50% Merlot, 30% Cabernet Sauvignon and 20% Cabernet Franc, according to the bottle. It has aromas of black currant, black cherry and cedar, leading to flavours of black currant, plum, fig and espresso. Decanting is recommended if the wine is to be consumed immediately. 92. McWatter’s Collection Meritage 2013 ($25 for 550 cases). This is 57% Cabernet Sauvignon, 30% Merlot and 13% Cabernet Franc and was aged 15 months in French oak barrels. It begins with aromas of cassis and cedar, leading to layers of flavour – black cherry, plum, fig, espresso and spice – framed by the oak. With Cabernet Sauvignon taking the lead, this is a Meritage for aging. 92. Time Syrah 2013 ($35 for 200 cases). This is a bold wine and was aged a year in French oak to polish the full-bodied texture. Dark in colour, it begins with aromas that mingle pepper, herbs and deli meats with black cherry. On the palate, there are rich flavours of plum, fig, blackberry, vanilla and spice, punctuated by black pepper. 93. Earlier this year, Nk’Mip Cellars of Osoyoos was named the Canadian Winery of the year at the InterVin International Wine Awards, held this year in St. Catherines. Winning major awards has become routine for this winery. The first aboriginal-owned winery in North America when it opened in 2002, its is one of the most successful businesses operated by the entrepreneurial Osoyoos Indian Band. Three recently released reds from the superb 2014 vintage showcase the quality of the wines. The wines – a sold-out Merlot, a Cabernet Sauvignon and a Syrah – are in the winery’s Qwam Qwmt tier. The phrase means “achieving excellence” in the band’s aboriginal language. It was chosen to designate the top tier because the usual term, “reserve,” would not have been meaningful for a winery whose vineyards and operations are literally on the Osoyoos Band’s reserve. A number of the band’s businesses are, or have been, structured as joint ventures with partners who can bring specialized expertise to the project. The joint venture partner for Nk’Mip initially was Vincor International, with a 49% interest and an agreement to market the wines. That arrangement is still in place, although the partner today is the Ontario Teachers Pension Fund. This fall, the fund purchased the Canadian wineries originally owned by Vincor and then by Constellation Brands, which had taken over Vincor in 2006. It appears that Teachers will leave the management, including the marketing staff, in place. When it comes to sales, this is a well-oiled machine that benefits Teachers and, in this instance, the Osoyoos Indian Band. One of Vincor’s earliest decisions in 2002 was to recruit Randy Picton, (right) a late-blooming winemaker with immense talent. At CedarCreek, his mentor was winemaker Tom DiBello who handed more and more responsibility to Randy as he gained experience. Randy passed this forward at Nk’Mip by mentoring two aboriginal cellar staff, both of whom started at the bottom, like he did. Both have also flourished. Osoyoos Indian Band member Justin Hall, now the assistant winemaker, asked Randy for a job after he completed high school. He was soon cleaning barrels and doing the other unromantic work necessary before great wines are made. As he added to his winemaking qualifications – including a diploma in enology and viticulture from Lincoln College in New Zealand - Justin was given more responsibilities in the winery. Aaron Crey, a member of the Cheam Indian Band in the Fraser Valley, also started cleaning barrels (along with other jobs at the Spirit Ridge Resort). He has since completed the Lincoln University program and is now the cellar supervisor. Personnel practices are just part of the explanation behind the consistency of the Nk’Mip wines. The winery sources grapes from several premium sites, including the vineyard around the winery and the legendary Inkameep Vineyards near Oliver. The latter is one the oldest, if not the oldest, vinifera planting in the Okanagan. Combine talented winemaking, good grapes and a well-equipped winery and you should get good wines. Here are notes on three. All of them have been aged 18 months primarily in French oak barrels. Nk’Mip Qwam Qwmt Merlot 2014 (Sold out but likely available in restaurants and private wine stores). This begins with aromas of blackberry, black currants and vanilla, leading to bold flavours of black cherry, figs and a touch of vanilla. 92. Nk’Mip Qwam Qwmt Cabernet Sauvignon 2014 ($30.49 plus tax). The wine begins with aromas of black currants and blueberry with a touch of spice and cedar. On the palate, there are flavours of cassis, black cherry and vanilla. The texture is polished, with long ripe tannins. This is a wine for cellaring until 2024. 91. Nk’Mip Qwam Qwmt Syrah 2014 ($30.49 plus tax). This wine announces itself with aromas of black pepper and plum that are echoed in the complex, layered flavours of black cherry, leather and deli meat spices. The body is full and generous, with a long finish. 92. Since classic Bordeaux varietals were planted in the Okanagan after 1993, Cabernet Franc usually has lived in the shadow of Merlot and Cabernet Sauvignon. Arguably, its bright brambly flavours have been at the heart of many good Meritage blends. In recent years, the variety’s profile has been on the rise, and for good reason. In the Okanagan, the variety performs better than Cabernet Sauvignon (unless the latter is grown on an exceptional site). Painted Rock’s vineyard is one of those top sites. Located on a bench overlooking Skaha Lake, its west-facing slope benefits from the sun from mid-morning to late in the day. All the Bordeaux varieties do well there, as does Chardonnay and Syrah. This post is limited just to the winery’s Cabernet Franc 2014, a recent release and a wine I would recommend if you want to give a special bottle to a wine-loving friend. Painted Rock wines are available in many private wine stores. The first thing in its favour is the vintage, the best in the Okanagan since Bordeaux grapes were planted. That is not just my opinion. Anyone who has tasted the 2014 reds knows these are among the most balanced and elegant wines ever made here. Painted Rock’s first vintage was 2007, not a bad year either. But nothing like 2014. As an aside, the 2015 and 2016 vintages have also been very good. Leave room in your cellar for some wines from those vintages. But go heavy on the 2014 reds now while they are available. Painted Rock Cabernet Franc 2014 ($44.99 for 438 cases). This wine was aged 18 months in French oak (30% new). It begins with rich, intense aromas of smoky black cherry and vanilla. The oak subtly frames the flavours of plum, black currant, black cherry and coffee. The finish is long, with hints of dark fruit and chocolate. The ripe tannins still have some grip, suggesting the wine will age well for a decade. Decant it is you want to drink it now. 92. This fall, Blasted Church Vineyards retained consulting winemaker Pascal Madevon to work with its resident winemakers, Elaine Vickers and Evan Saunders, on super premium handcrafted red wine. Perhaps handcrafted is not the right word. Some of the grapes were actually crushed by foot. I was even invited to join in the fun. When I learned how cold the recently-picked grapes were, I passed on the opportunity. Given how well equipped today’s Okanagan wineries are, it might surprise some how much foot crushing still goes on. To begin with, the human foot is not only the oldest way of crushing grapes; it also is the gentlest. Secondly, sometimes the winery press is just too big for limited quantity of grapes needing to be crushed. I suspect that was why Pascal rounded up winery volunteers to freeze their toes. The wine already has a name: Nectar of the Gods. Obviously, it will not be released for a couple of years. Meanwhile, you might search out Nothing Sacred which, at $40 with a production of 100 cases, is currently the winery’s flagship Bordeaux blend. The winery began making it in 2007. When they skipped making it in 2012 and 2013, they heard from disappointed customers who had begun to collect verticals. After Elaine Vickers was promoted to Blasted Church’s head winemaker in 2014, she made a fine Nothing Sacred from that vintage. It crowns the winery’s Revered Series, as Blasted Church calls its reserve tier. She would like to make subsequent releases of it, subject to the winery’s strict discipline about the Revered wines: it is only made in the best vintages. The 2014 vintage was one of the best yet in the Okanagan. The red wines from 2014 are among Elaine’s favourites. I did not hang around the winery long enough to find out whether Elaine also joined in the grape stomp that particular afternoon. It might have seemed odd, given how well grounded she is in modern science. Born in Ontario in 1976, she lived in Abbotsford during her high school years and then got a master’s degree in molecular biology at the University of Victoria. On graduation, she moved to a job at Vancouver General Hospital while pursuing another passion: playing Ultimate Frisbee. Her interest in winemaking began when she worked at a winemaking store while she was an undergraduate. After moving to Vancouver, she advanced her knowledge of wine by working weekends in a wine store and by taking Wine & Spirits Education Trust Courses. Some of her Frisbee teammates worked for wine agencies, further spurring her interest. In 2009 she went to the wine school at the University of Adelaide. A year of study and practical winemaking in the student winery earned her a graduate diploma in oenology. She returned to Canada in 2010 and, after working the harvest at the Jackson-Triggs winery in Oliver, she moved to Blasted Church as a cellarhand under winemaker Richard Kanazawa. When Richard left early in 2011, Elaine remembers that she “panicked because I was the only one here and I was not ready to be the winemaker.” That summer, however, the winery hired consultant Mark Wendenburg, the former veteran winemaker at Sumac Ridge Estate Winery. “He just trained me up from cellarhand to assistant winemaker to winemaker, pretty much as fast as he could because he was busy with other clients as well,” she says. She took over the winemaker’s job in August, 2014. From 2011 to 2013, Blasted Church production grew from 17,000 cases a year to around 25,000 cases. When Mark moved on to his other Okanagan clients, the winery added assistant winemaker Evan Saunders, a graduate of Brock University who had previously worked at Osoyoos Larose Winery. Blasted Church today has a large portfolio, but not too large for Elaine. “Our size is a nice size,” she maintains. “We still have time to do a few small experiments.” Like Nectar of the Gods. Here are notes on current releases from the winery. Blasted Church OMG 2012 ($24.50 for 800 cases). This traditional method sparkling wine is a blend of 66% Pinot Noir, 22% Chardonnay and 12% Pinot Blanc. The three years the wine spent on the lees before disgorging has given it slight toasty notes and a creamy texture. There are flavours of apple and pear with a pinch of hazelnut. The wine’s brisk acidity gives it clean and refreshing finish. 91. Blasted Church Pinot Gris 2015 ($20.50 for 2,911 cases). This is 90% Pinot Gris but gets added complexity the 5% Chardonnay, 3% Viognier and 2% Gewürztraminer in the blend. The wine begins with a floral bouquet that leads to flavours of grapefruit and pineapple. The finish is crisp and refreshing. 90. Blasted Church Hatfield’s Fuse 2015 ($15 for 6,300 cases). This is one of Blasted Church’s most popular whites. It is a blend of 10 varietals: 22% Gewürztraminer, 21% Pinot Gris, 20% Viognier, 13% Optima, 8% Ehrenfelser, 5% Pinot Blanc, 4% Chardonnay and 4% Chardonnay Musqué, 2% Orange Muscat and 1% Riesling. This yields a juicy, fruity wine with dramatic aromas of spicy fruit and flavours of lychee, mango and grapefruit. 91. Blasted Church Gewürztraminer 2014 ($17.90 for 1,720 cases). Full-bodied with a lingering finish, this wine has aromas and flavours of lychee and spice. The wine has the slightest hint of sweetness but it finishes dry. 90. Blasted Church Swear To God 2015 ($30 for 127 cases). This wine was fermented and aged in barrels (66% French, of which 40% was new oak, and 34% American oak – three years or older). The wine displays aromas of vanilla, peach and pear leading to buttery flavours of fruit preserves. Only two of the five barrels used here went through malolactic fermentation, a decision which gave the wine a rich texture; the other three barrels preserved acidity and the flavours of peach. 90. Blasted Church Bible Thumper 2015 ($30 for 100 cases). This is an oak-aged Viognier. The 2015 vintage gave the winery atypical but delightful aromas recalling Sauvignon Blanc. The wine has flavours of guava and grapefruit. The texture is rich and creamy. 91. Blasted Church Big Bang Theory 2015 ($19 for 4,500 cases). This is an easy-drinking fruit-forward red. It is a blend of 50% Merlot, 15% Malbec, 10% Cabernet Sauvignon, 10% Pinot Noir, 9% Lemberger and 6% Syrah. The wine begins with aromas of red currant and cherry, leading to flavours of strawberry, cherry and cranberry. The tannins are soft and the texture is juicy. 88. Blasted Church Merlot 2014 ($26 for 907 cases). Four per cent Syrah and 3% Malbec have been added to flesh out the blend and tweak the aroma. The wine has spiced dark fruit and blackberry on the nose. The palate echoes the spiced dark fruit; there is a hint of cedar on the finish. Long ripe tannins give the wine fullness of texture. 91. Blasted Church Cabernet Sauvignon Merlot 2014 ($26 for 1,545 cases). This is 50% Cabernet Sauvignon, 42% Merlot and 8% Malbec. The wine has aromas of blackberry, plums and mint, with flavours of black currant mingled with pepper. The Cabernet gives this a hint of menthol on the finish. The tannins are firm but, with breathing, a rich texture emerges. 90. Blasted Church Syrah 2014 ($27.50 for 1,880 cases). Three per cent Viognier is co-fermented with the Syrah, a technique that lifts the aroma and stabilizes the colour. The wine begins with aromas of blackberry, dark cherry and pepper. The palate echoes the aromas, along with flavours of plum and cured meats. 91. Blasted Church Cross To Bear 2014 ($40 for 11 cases). This is 98% Syrah and 2% Viognier. On of the wines in the Revered tier, it is made only in the best vintages – and 2014 was such a vintage. The wine begins with aromas of plums, black pepper and spicy cured meats, leading to flavours of plums and figs, with espresso and a touch of pepper on the finish. 92. Blasted Church Holy Moly 2014 ($40 for 150 cases). This is 100% Petit Verdot with a colour that is typically (for the variety) black as night. The aroma mingles floral notes with blackberry and spicy dark fruit. The wine is concentrated in the mouth, with flavours of plums, figs and blackberry. The variety’s minerality adds a note of graphite on the finish. 94. Blasted Church Nothing Sacred 2014 ($45 for 101 cases). This is 40% Merlot, 20% Petit Verdot, 20% Malbec and 20% Cabernet Sauvignon. Each parcel of fruit was fermented and aged separately in barrel, with the very best barrels selected for this blend. Total time in barrel was 20 months (80% French oak, 20% American; most of the barrels were new). The wine has a concentrated texture, suggesting an ability to age. It begins with aromas of raspberry and blackberry, leading to flavours of blackberry and black currant with a hint of spicy dark fruit. 94. A big sparkling wine trend is sweeping through the British Columbia wine industry. In recent weeks, I have blogged first time release of sparkling wine from Fitzpatrick Family Vineyards, Meyer Family Vineyards and Orofino Vineyards. As well, I have posted effusive reviews of sparkling wines from Blue Mountain Vineyard & Cellars, one of the most experienced producers of bubbly in the Okanagan. I have also posted enthusiastic reviews of Maverick Winery’s Ella, a very fine sparkling wine; of Tantalus Blanc de Noirs 2013; and “I Do” from Intrigue Wines. I have reviewed the Steller’s Jay Sparkling Gewürztraminer and the same winery’s Sparkling Shiraz. And I have been promised a bottle of the soon-to-released Daydreamer Sparkling Shiraz. I will post reviews shortly of two new sparkling wines from Evolve Cellars. That is just scratching the surface. There is a burgeoning choice of sparkling wines from B.C. wineries. That is a very good thing, for we now get to try Champagne quality wines without always paying Champagne prices. The proliferation of sparkling wines also tells me that consuming patterns have matured. We are no longer restricting these wines just to special occasions like New Year’s Eve or weddings and birthdays. Many of us have discovered that these are versatile food wines. I recently washed down a meal of pierogies with a few glasses of bubble. I suppose you could open a bottle of vodka with your pierogies, given the Polish roots of the cuisine, but you risk inebriation. The usual objection to opening a bottle of bubbly is the mistaken notion it has to be consumed within the hour. In fact, most good kitchen stores will have a device that snaps onto the top after the cork or screw cap is removed. Such a device keeps the remaining bubbles in the bottle and the wine can be left in the refrigerator for a day or two. The latest producer to release a bubbly is Serendipity Winery of Naramata. As an aside, it is surprising how few of the Naramata Bench’s wineries actually produce sparkling wine. No matter the technique, there is no easy way to make sparkling wine other than carbonating it. And carbonated wine is just an inferior bubbly, best used to launch boats or celebrate sports championships. The Serendipity wine, called Sparkling Truth, is made in the traditional way, starting with Chardonnay grapes. The wine has its secondary fermentation – the one that produces the bubbles – in the actual bottles. In this case, the winery made 2,107 bottles and riddled them all (likely by hand) over 21 days. Riddling is the process of rocking each bottle gently until the yeast lees are deposited in the neck against a crown cap. The pressure in the bottle expels these when the cap is removed during final bottling. Each bottle is topped up and then sealed with the familiar mushroom cork. A word of caution: there seems to be a lot of pressure in each bottle of Serendipity Sparkling Truth. When I removed the wire cage that holds the cork, it shot from the bottle on its own with loud explosion. This was surprising, since the bottle had been in the refrigerator for several days and was not shaken on the way to the kitchen. Fortunately, my face was not above the bottle. I learned that bit of caution years ago. The wine, however, tasted fine. Serendipity Sparkling Truth 2014 ($50). This is a fresh and floral wine with a big, almost creamy, mouthful of fruit – apples and green plums. The pressure in the bottle makes for a lively display of bubbles in the glass. This is an elegant wine. 91. Winemaker Nikki Callaway at the Quails’ Gate Estate Winery has revived the tradition of “nouveau” wine in the Okanagan. On the third Thursday in November, the winery released a 2016 vintage Gamay Noir under the name, Cailleteau, which means baby quail. This mirrors the historic practice in Beaujolais where nouveau wines made with Gamay are rushed to market on that date. The tradition likely arose from the desire of vintners to celebrate the end of the harvest. Nouveau wines are uncomplicated, easy to drink reds that are guzzled down with rustic artisanal meals. To my knowledge, no Okanagan winery has made a nouveau-style wine since the late 1990s. The first one of which I have a record was Calona Wines Okanagan Vin Nouveau 1983, made with Maréchel Foch grapes. There likely was no Gamay grown in the Okanagan while Foch as abundant. Calona made 250 cases and the wine, ready to drink six weeks after harvest, was sold for $5 a bottle. In British Columbia, the fleet-footed Anthony von Mandl – the owner of Mission Hill Family Estate Winery – jumped on the trend in the early 1980s. The Mark Anthony Group, his wine marketing agency, began importing Beaujolais Nouveau in 1981. That year, agency personnel rushed some of the wine from France by air to tastings in Toronto and Vancouver. In 1982, it sponsored a race by 25 restaurant employees in Vancouver to rush the wine to their restaurants on release. By 1983, Mark Anthony was importing Beaujolais Nouveau from five producers. Eventually, the nouveau frenzy burned itself out. The Liquor Distribution Branch had difficulty selling wines which, because they were shipped by air, were overpriced for the quality. And Okanagan wineries stopped make Foch Nouveau after most of the Foch vines were pulled out in 1988. Kudos to Nikki for reviving the tradition – and with Gamay Noir. Here is a note on that wine and other recent, or future releases from Quails’ Gate. Quails’ Gate Cailleteau Gamay Nouveau 2016 ($19.50 for 250 cases). This is 100% Gamay Noir in the easy-drinking nouveau style. It is a fresh and lively wine with aromas and flavours of cherry and strawberry. The texture is silky. 90. Quails’ Gate Rosemary’s Block Chardonnay 2015 ($40 for 476 six-bottle cases). Barrel-fermented and aged for 11 months, this wine has appealing toasty notes of hazelnut mingled with the citrus aromas. That leads to flavours of citrus and brioche with a suggestion of saltiness, likely reflecting the terroir of this particular Chardonnay block. 92. Quails’ Gate Stewart Family Reserve Chardonnay 2015 ($35). This is a lush and seductive Chardonnay with aromas and flavours of peaches and citrus and a hint of vanilla on the long finish. 92. Quails’ Gate Merlot 2014 ($21.99 for 5,090 cases). Aged 18 months in barrel, this begins with aromas of cassis, blueberry and vanilla. It is full-bodied with a core of sweet berry flavours but a long, dry finish. The tannins have enough grip to enable to wine to age well. Impatient consumers should decant it for current drinking. 90. Quails’ Gate Old Vines Foch 2014 ($19.31 for 3,750 cases). This wine is made with fruit from 36-year-old vines planted in the winery’s Osoyoos vineyard. The terroir is not nearly as suitable for Foch as that of the estate vineyard and the wine, while good, lacks the intensity of the Foch Reserve. It has aromas and flavours of cherry, along with black coffee and leather. 88. Quails’ Gate Old Vines Foch Reserve 2014 ($37.64 for 1,550 six-bottle cases). This is the 20th vintage, and one of the best, of this cult wine, made with fruit for 50-year-old vines in the estate vineyard. The wine is big and rich, beginning with aromas of fig, plum and chocolate and continuing with flavours of black cherry, plum and chocolate. A hint of oak winds it way through the flavours. The ripe tannins give the wine a svelte texture. 92. Quails’ Gate Clone 828 Pinot Noir 2014 ($56.62 for 300 six-bottle cases). Legend has it came to the Okanagan in a suitcase of cuttings from Domaine de la Romanée-Conti. That is unlikely because Quails’ Gate planted this clone only in 2006. Whatever the truth, this is a very pretty wine. It has floral aromas along with aromas of strawberries and cherries that are echoed on the palate. The silken texture adds to the impressive elegance of the wine. The winery releases a Clone 828 only when it is exceptional; the last one was made in 2010. In most years, the clone makes its contribution as a blend in other premium Pinots. 92-93. Quails’ Gate Richard’s Block Pinot Noir 2014 ($53 for 490 six-bottle cases). A blend of clones 115, 117 and 667, this wine is made intentionally in what the winery calls an “old world” style. It begins with aromas of plum, cherry and so-called forest floor notes. The structure is concentrated. The flavours are savoury and spicy, with notes of cherries and dark fruit. The wine is available only at the Quails’ Gate wine shop. 93. 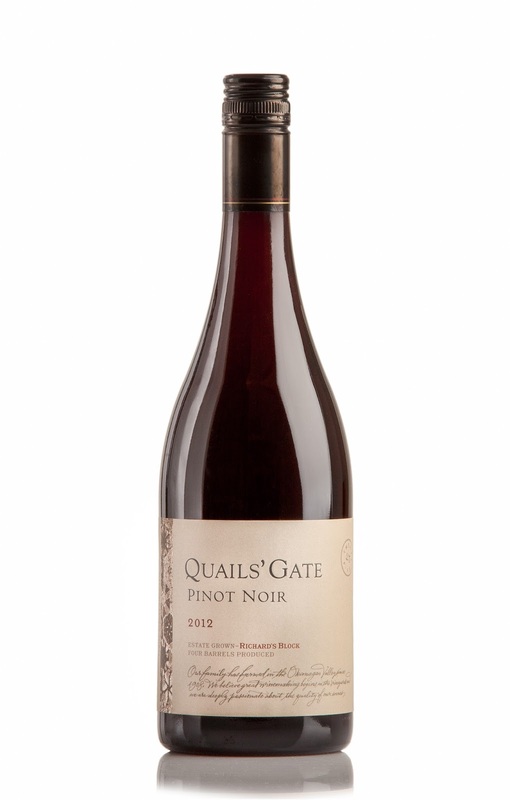 Quails’ Gate Stewart Family Reserve Pinot Noir 2014 ($45 for 1,948 cases). This is the flagship Pinot Noir, aged for 10 months in premium French oak barrels (50% new). It begins with aromas of cherries and plums leading to flavours of spice, plum and dark fruit. The seductive flavours are framed a concentrated texture. 94. Quails’ Gate Boswell Syrah 2013 ($52.19 for 860 six-bottle cases). The wine begins with aromas of pepper and ripe berries, leading to concentrated meaty and dark fruit flavours. The finish lingers. 94. Quails’ Gate Boswell Syrah 2014 ($52.19 for 1,140 six-bottle cases). This wine begins with spicy aromas of red fruit. It is full-bodied with a luscious texture and layers of dark cherry and spice cake flavours. 94. Quails’ Gate The Connemara 2014 ($55.65 for 200 cases). This is 55% Merlot, 30% Cabernet Sauvignon and 15% Cabernet Franc. This blend is at once elegant and powerful. It begins with red berry aromas. On the palate, there are flavours of black currants and figs with hints of licorice and chocolate. The 18 months of aging in French oak have polished the long, ripe tannins. 93. Fortified Vintage Foch 2014 ($18.17 for 410 cases of 375 ml bottles). Suitably dark for a Port-style wine, this begins with aromas of spiced plums and dark Christmas fruits. The flavours are a luscious mix of spiced fruit, licorice and chocolate that linger on the finish. 91.